250 pages filled with pictures of Parisians. A unique portrait of the City of Lights in your library. You can browse through the first few pages of the book. 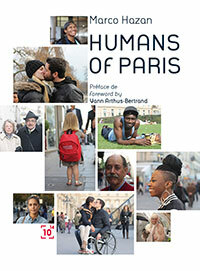 Humans of Paris is printed in a 23 x 17 cm format (portrait orientation), so you can really enjoy the pictures. It has 256 pages in full color. It is a hardcover edition, for more comfort while reading and a better protection of the pages. Humans of Paris is above all a community. It then seemed appropriate to Cent Mille Milliards and Marco to involve it in the project, hence the decision to print it on demand – more environment and librarian-friendly – and to launch a corwdfunding campaign on Ulule. The book is just as much Marco’s than the vibrant Humans of Paris community’s. You will be sent on the website of my publisher Cent Mille Milliards.